As someone who has spent most of his adult life working in Little Tokyo (my 40+ years were divided almost equally between The Rafu Shimpo and the Japanese American National Museum), I have witnessed the ups (1970s) and the downs (1990s) of this historic and cultural neighborhood. Over the years, many private and public projects were inserted into Little Tokyo, mostly indifferent to the needs and desires of our community. So when I heard about the crafting of a community vision for Little Tokyo by its residents, non-profit organizations, businesses and religious institutions, I knew that this was an idea long overdue. The project was dubbed Sustainable Little Tokyo (SLT) and it has in a short period obtained some funding, attracted the attention of a national project and organized itself with three areas of interest for Little Tokyo. Certainly, many people have heard about some aspect of SLT, but it was thought that an information-sharing campaign was important to the project’s success. As part of SLT outreach committee and as the incoming board chair for the Little Tokyo Community Council, I was charged with writing the first of a series of columns on Sustainable Little Tokyo for The Rafu Shimpo. While future columns will delve into specific activities and ways more people can get involved and participate, I will provide the broad outline of SLT. Sustainable Little Tokyo was first organized in 2013. Much of the impetus came in the aftermath of Metro’s proposal to build its Regional Connector through Downtown Los Angeles and Little Tokyo. The original plan contained elements potentially detrimental to the businesses, non-profits and residents of Little Tokyo, including running the trains at street level and the absence of a local station. A grassroots community response led by organizations such as the Little Tokyo Community Council (LTCC) and the Little Tokyo Business Association (LTBA), among others, enlisted the support of a number of influential elected officials, which led to the transformation of the original plan. The current configuration positions the trains underground, where they will stop at the Little Tokyo/Arts District station. Metro also agreed to underwrite marketing and business support through the duration of the construction. The Metro experience demonstrated that the greater Little Tokyo community could influence such projects positively if it pulled together. Community members recognized that new challenges from potential large developments in Little Tokyo were on the horizon. 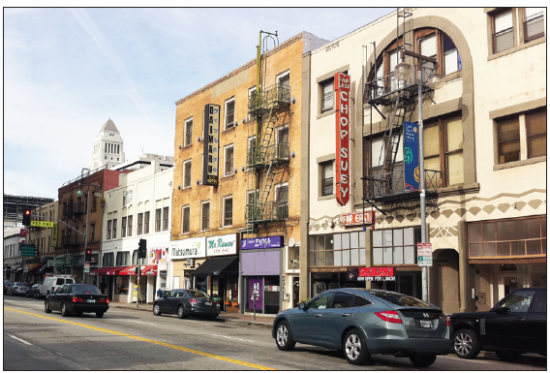 Instead of Little Tokyo reacting to each new challenge, it was proposed that a forward-looking plan be developed that would enhance the local small businesses and treasure Little Tokyo’s heritage. In 2013, after a three-day charrette, in which over 200 individuals reviewed and discussed different scenarios, a vision document was crafted and Sustainable Little Tokyo had begun. For the project to succeed, it must enable sustainability for Little Tokyo economically, environmentally and culturally/historically. Community partners and members facilitate the continuing development of SLT and its implementation through a steering committee. Partners include the Japanese American Cultural and Community Center (JACCC), Kizuna, LTCC, the Little Tokyo Service Center (LTSC), Nisei Week, Nishi Hongwanji Buddhist Temple and Zenshuji Buddhist Temple. Resource partners are Enterprise Community Partners, Global Green, National Resource Defense Council, National Trust for Historic Preservation, and Neighborworks. Sustainable Little Tokyo is also part of the EcoDistricts Target Cities two-year pilot program, a Clinton Global Initiative program (more on this in a future column). Sustainable Little Tokyo has three work areas: Real Estate and Built Environment; Educational Initiatives and Community Engagement; and, Arts and Culture. Some of their efforts are already visible, including the Little Tokyo Utility Box Public Art Project, organized by the JACCC in collaboration with SLT and L.A. City Councilman Jose Huizar’s office. The work of the Real Estate and Built Environment subcommittee is essential for a healthy and prosperous Little Tokyo. Along with local business owners, it has been exploring the possibility of economic benefits from renewable energies and engaging with government agencies about catalytic projects that involve storm water drainage and recycling gray water. Significantly, the subcommittee has been assembling ideas for the potential development of the three major parcels of public land in Little Tokyo and what elements would be preferable, including green infrastructure, affordable housing, small retail and green space. A community proposal for the property north of First Street between Alameda and Aiso, for the Mangrove parcel east of the current Gold Line Station, and for the area next to the proposed Little Tokyo/Arts District station will be shared with local stakeholders soon. The hope is to create a strong vision for these spaces that integrates into the historic community. SLT will host outreach tables during the Obons at Nishi Hongwanji Buddhist Temple on July 11 and 12 (same weekend as Zenshuji Buddhist Temple) and at Higashi Honganji Buddhist Temple on July 25 and 26. It will also participate in the 75th Nisei Week Festival on Aug. 15 and 16.